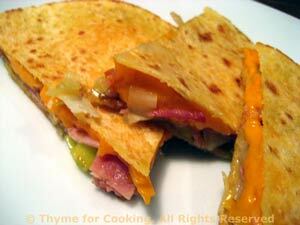 Quesadillas, Ham, Leek and Cheese, quick and easy, Thyme for Cooking. Any flavor of cheese and any type of meat will work in a quesadilla, even tuna or smoked salmon. The idea is to keep it thin so it stays together. Garnish with a few olives if you have them, or a bit more of the same meat you used, cold. Add leek, paprika and sauté until limp. Place 1 tortilla on a baking sheet. Place the thinly sliced meat in one layer. Spread the leeks evenly over the meat. Lay the other tortilla on top and press down. Brush the top with oil and bake, 400F (200C) for 10 minutes, until golden and hot. Slice in half, then each half into thirds. Place 3 wedges on each plate and serve.